Brand new solo album by the former MOBY GRAPE co-founder!Don Stevenson had already released a highly acclaimed solo album in 2011 with "King Of The Fools". For his current album, he teamed up with Dane Clark, since 1996 drummer in the band of John Mellencamp, who is also responsible for the final mix of the album. An illustrious band of fellow musicians support Don on this album, including his two GRAPE friends Jerry Miller and Peter Lewis. Don left Dane Clark the seat behind the drums and played guitar on the songs. And of course his place was behind the microphone. It is fair to say that "Buskin 'In The Subway" has become a giant album. 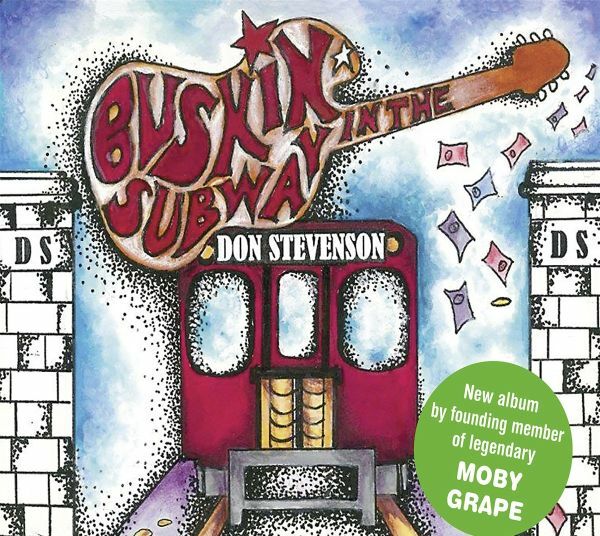 Everything that MOBY GRAPE has already identified, this sleepwalking sure fusion of different music styles, succeeds Don Stevenson and his colleagues here again. Folk, blues, rock, jazz - everything is back! It would also have been a wonderful new GRAPE album. A nice idea is also the new version of the title "8:05", which can be found originally on the debut album of MOBY GRAPE. A great record that captures the spirit of early US Westcoast music and carries it into the present time. Not re-enacted, but interpreted by original protagonists. Not only recommended for neo or old hippies!Incidentally, the motif on the front cover of this CD was designed by none other than Helen Hersh, who was responsible for the poster design of this legendary rock temple Fillmore East in New York at the end of the sixties / early seventies and also designed many touring posters by MOBY GRAPE .